The need for pharmacy technicians is expected to increase 9 percent through 2024. Technicians work under the supervision of a pharmacist in a variety of settings, including home infusion pharmacies, community pharmacies, hospitals, and other health care settings. The shortage of registered pharmacists, wide availability of new drugs, the aging population, and workforce turnovers influence the demand for technicians. The shortage of registered pharmacists and the widening of the services that pharmacies offer have forced the industry and state bodies to redefine the role of the technician in the pharmacy. Technicians are the liaison between patients, pharmacists, physicians, and insurance companies. As a result, good communication is essential. To receive, read, and interpret prescriptions, review, reorder, recall, and label inventory, and update patient records, technicians must be meticulous. The other responsibilities that a technician might perform include mixing intravenous solutions, preparing and dispensing medications, receiving electronic prescriptions, handling order entries, and preparing insurance claims. 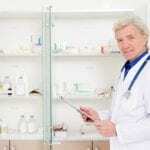 These and other responsibilities show the vital role the technician has in the pharmacy and the reason employers’ place heavy emphasis on certification for the pharmacy technicians. The Pharmacy Technology Program at El Paso Community College provides students with the specialized skills they need to function as a vital member of the pharmacy team. The technician’s role in the pharmacy has evolved, so preparation for practice covers the key areas that will help graduates reEl PAsceive and interpret prescriptions, mix sterile pharmaceuticals, prepare medications for dispensing, and maintain an inventory of medication. EPCC offers two options: the Certificate of Completion and the Associate of Applied Science. The certificate program may be completed in two semesters, and the AAS requires an additional year for completing the general education and science courses. Course topics include pharmacy terminology, introduction to pharmacy, computerized drug delivery systems, pharmaceutical mathematics, and pharmaceutical drug therapy. Students also learn compound sterile preparations, pharmacotherapy and disease process, and participate in a pharmacy externship. The program will conclude with a Pharmacy Technician Certification Review. Graduates are prepared to succeed on the National Pharmacy Technician Certification Examination. After confirmation of acceptance to the program, students must register as a Technician Trainee with the Texas State Board of Pharmacy, complete a background check, obtain CPR certification, complete the immunization and titers, complete HIPAA training, provide a recent copy of a physical exam, and provide documentation of liability insurance. Students may also need to complete substance abuse and purchase uniform for the externship site. Tuition costs $4,700 for the 8-mont certificate program and $9,400 for the AAS program. The cost includes lab fees, professional practice, textbooks, and one lab coat. PIMA prepares pharmacy technician students for a rewarding career in health. The curriculum includes classroom instruction and hands-on training. Students learn how to mix intravenous solutions, count tablets and label bottles, receive electronic prescriptions, receive written prescriptions, stock inventory and prescriptions, manage request for refills, and input orders into the computer. The program covers 350 hours in the classroom, 250 lab hours, and 240 externship hours for a total of 35.5 credits. Full-time day students can complete the requirements in 36 weeks and evening students will complete the program in 41 weeks. Course topics include anatomy, physiology and terminology, math fundamentals, CPR and First Aid, pharmacy math, inventory maintenance, pharmacology, pharmacy law and ethics, pharmacy technician duties, fundamentals of chemistry, and pharmacy computer applications. Graduates will receive a certificate in Pharmacy Technician and will be eligible to take a national exam to become a Certified Pharmacy Technician. Tuition for the program is $13,617. Books and supplies cost an additional $904. The comprehensive pharmacy technician program at UTEP prepares students to take the PTCB exam and enter the pharmacy field. The curriculum covers 375 hours of theory instruction in 4 months. The clinical externship is not a requirement, but it gives graduates the opportunity to put their knowledge to practice. Those who accept the externship opportunity will be placed in a healthcare organization near their location. The classroom lectures cover key topics include pharmacy calculations, medical terminology, dosage calculations, the top 200 drugs, IV flow rates, drug compounding, reading and interpreting prescriptions, inventory control, dispensing prescriptions, and billing the reimbursement. Tuition for the program is $3,000. El Paso ISD offers a pharmacy technician program in conjunction with the El Paso Community College. The program is open to high school students 16 years and older. Applicants must also have a minimum grade of 85 in Biology or an overall GPA average of 90%. During the first year, students will earn 2 credits per semester and will take courses in anatomy and physiology, medical terminology, principles of health science, medical law and ethics, well and health promotion, health science, and introduction to health professions. The second year will cover pharmaceutical mathematics, introduction to pharmacy, IV certification, and pharmacy technician practicum. The practicum will be conducted at an extern site and will give students practically apply their knowledge and skills gained in the first year. To participate in the practicum experience, students must complete a background check, fingerprinting, TB test, and drug screen. A social security card and valid Texas ID are necessary to participate in the clinical rotation. Graduates are eligible for IV Certification and the PTCE exam.